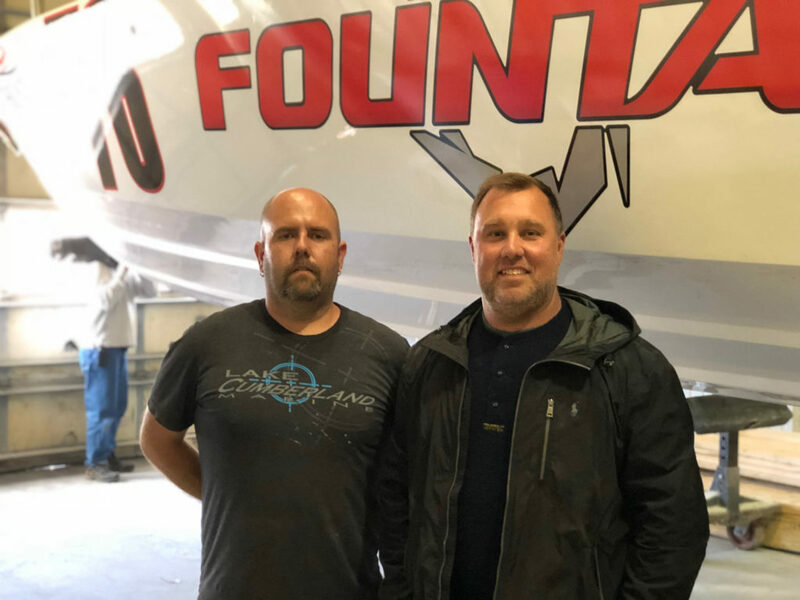 The sons of fathers famous in the high-performance marine world, Reggie Fountain, III, (left) and William Moore have worked closely on the Fountain kilo boat project—and put the 40-foot V-bottom through its first test sessions. Imagine if every day in your professional life people compared you to your father — and your father was a legendary figure in your shared profession. Such is the case for Reggie Fountain, III, who currently works at Fountain Powerboats — the famed Washington, N.C., sportboat and center console company his father founded — and William Moore, the son of Bobby Moore, one of offshore powerboat racing’s greatest all-time throttlemen. Depending on your perspective, you could find it to be a burden or a blessing. But for Reggie Fountain, III, and William Moore, it is decidedly the latter. Since the Fountain V-bottom kilometer speed record project began taking shape several months ago, they’ve worked closely together. And when the twin 1,900-hp turbocharged Sterling Performance engines were installed in the 40-foot canopied boat, Moore and Fountain were the first to run it. As it happens, Moore is more familiar than most — maybe even all — folks save for D’Anniballe with the 557-cubic-inch Sterling powerplants. The 44-foot Super Boat International Unlimited-class CT Marine catamaran he throttles with driver/owner Andy Strobert is powered by a pair of the same Sterling engines, albeit with their output lowered to a longer-living 1,600-plus hp. While Fountain ran the kilometer boat with throttleman Jeff Harris, another Fountain Powerboats veteran this Tuesday and last Saturday, he said he enjoyed his time in the cockpit with Moore, a longtime family friend who consulted on the project — especially when it came to dealing with the Sterling engines. Neither Fountain nor Moore, who joined Harris in the cockpit for yesterday’s effort was intimidated to have their fathers, literally — in the case of Fountain as his dad managed the entire kilo-boat project — looking over their shoulders. For Moore, the significance of testing the boat with the son of another legendary father was not lost.